The flexibility and durability of artificial grass football pitches is leading to many full sized facilities being built across the country. 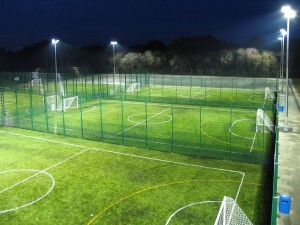 Organisations like sports clubs, schools and universities have these facilities built for competitive matches and events. The synthetic football pitch size and dimensions for full sized areas can vary between 90-120m in length and 45-90m in width. Depending on budget and the outdoor space that is available, the size of a football pitch will typically fall between these FA guidelines. Contact us today for information on the prices for installing these facilities in the UK. We have carried out many construction projects for different clients and we would be happy to provide a quote for any work you need. Just get in touch with us and tell us what you need so we can reply back with all of the relevant information. Artificial grass football pitches can be used in all weather conditions with minimal damage to the playing surface. This is a vast difference to natural football fields which see many games and poor conditions in the wet and wintery months. This often leads to games or training having to be called off due to flooding and waterlogging on the pitch. 3G synthetic grass pitches are designed to replicate the playing qualities of real grass but with fewer maintenance requirements and longer lasting durability. These artificial grass surfaces can also be used as multi use games areas for playing rugby as well as football. Schools – Primary Schools and High Schools across the UK are constructing full sized synthetic grass soccer pitches to for PE lessons and 11-a-side and small sided football evening and weekend bookings. Colleges and Universities – Full sized artificial grass 3rd generation football pitch used for further education lessons, training sessions, College and BUCS football competitions. Leisure Centres – Third Generation football pitches are being constructed to full sized pitch dimensions to host recreational small sided e.g. 5 v 5, 6-a-side football and 11-a-side matches and training. Sports Clubs – Sport clubs such as football clubs need to build 3G artificial turf pitches to the dimensions of full sized areas so 11-a-side youth and adult training, matches and competition can take place. If you would like to find out how much a synthetic grass facility costs when constructed within full sized football pitch dimensions, please contact us and we will be happy to supply you with a quotation to outline budget prices. If you fill in the contact form with details of your enquiry, one of our professional team will get back to you with more details. All weather 3G 5-a-side football pitches are used across the country to host small sided football matches every day of the week. These small artificial pitch facilities tend to be installed in reduced sizes ranging from 25.91-42.65m in length and 16.76-25.91m in width. When we build these recreational pitches they will vary in costs and prices with the main factor influencing the costs being the size and dimensions. The area size of the pitch determines the amount of existing ground that needs excavating, edging, filling with MOT Stone and macadam, as well as the amount of turf carpet to surface the soccer pitch. 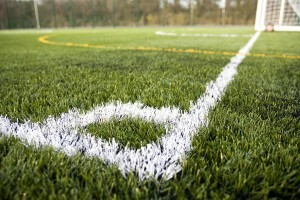 3G surfaced artificial turf football pitches are made with synthetic grass fibres combined with a sand and rubber infill. The sand ensures that the artificial grass yarn stands up right whilst the rubber infill gives the small sided soccer pitch the perfect playing characteristics i.e. ball bounce and ball roll to replicate a natural pitch. Depending on the dimensions and design of the facility, small sided soccer pitches can be fitted width ways along on the pitch. These pitches can be of various sizes to host a variety of small sided football games including 5-a-side, 7-a-side, 6-a-side and 9-a-side. The amount of synthetic turf and infill needed to surface theses pitches completely depend on the pitch’s area size. We can create a bespoke design for your football pitch which fits into the outdoor space you have, and suits your budget and price range. As professional sports pitch installers we have worked throughout the UK with schools, sports clubs and other organisations to create top quality football and rugby facilities. The video below shows our installers completing a full construction of a 3G synthetic football pitch at a school. We carried out the whole process from excavating the ground, installing a drainage system and sub base, and then laying the synthetic 3G carpet for the pitch. If you would like more information regarding synthetic football pitch size and dimensions or if you would like to receive a quotation outlining budget costs and prices please contact us with the details through our simple form. Be sure to include a description of your location, size of the proposed area and when you would like to commence construction and we will be happy to help.